Figure 1. 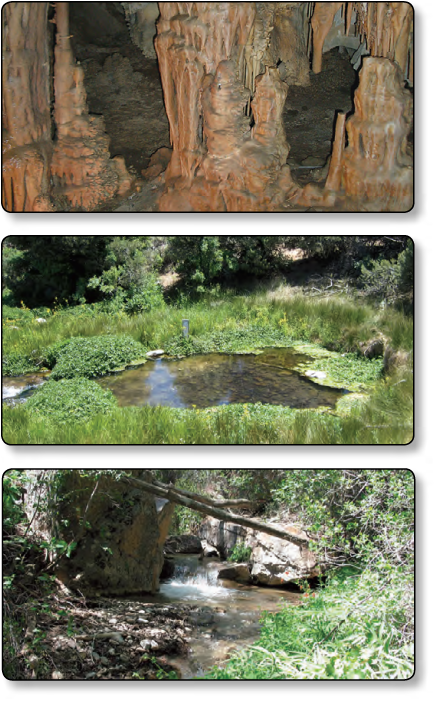 Lehman Caves, Rowland Spring, and South Fork Big Wash, southern Snake Valley, Nevada. The Secretary of the Interior through the Southern Nevada Public Lands Management Act approved funding for research to improve understanding of hydrologic systems that sustain numerous water-dependent ecosystems on Federal lands in Snake Valley, Nevada. 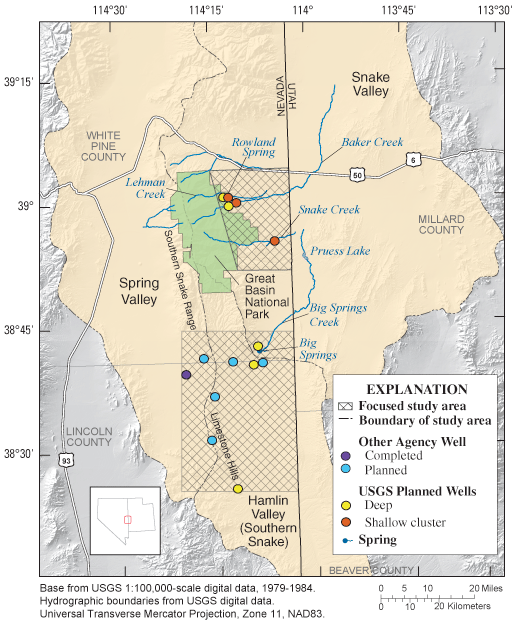 Some of the streams and spring-discharge areas in and adjacent to Great Basin National Park have been identified as susceptible to ground-water withdrawals (Elliott and others, 2006) and research has shown a high potential for ground-water flow from southern Spring Valley into southern Snake Valley through carbonate rocks that outcrop along a low topographic divide known as the Limestone Hills (Welch and others, 2007). Comprehensive geologic, hydrologic, and chemical information will be collected and analyzed to assess the hydraulic connection between basin-fill aquifers and surface-water resources, water-dependent ecological features, and the regional carbonate-rock aquifer, the known source of many high-discharge springs. Understanding these connections is important because proposed projects to pump and export ground water from Spring and Snake Valleys in Nevada may result in unintended capture of water currently supplying springs, streams, wetlands, limestone caves, and other biologically sensitive areas (fig. 1). The methods that will be used in this study may be transferable to other areas in the Great Basin. The National Park Service, Bureau of Land Management, U.S. Fish and Wildlife Service, and U.S. Forest Service submitted the proposal for funding this research to facilitate science-based land management. Scientists from the U.S. Geological Survey (USGS) Water Resources and Geologic Disciplines, and the University of Nevada, Reno, will accomplish four research elements through comprehensive data collection and analysis that are concentrated in two distinct areas on the eastern and southern flanks of the Snake Range (fig. 2). The projected time line for this research is from July 2008 through September 2011. Research Element 1—Assessment of the geometry and hydraulic properties of Cenozoic sedimentary rocks and coarse- and fine-grained basin-fill deposits. These properties influence the ground-water flow direction and magnitude, the potential for ground-water/surface-water interactions, and the locations and types of ground-water discharge. Element 1 will be accomplished by collecting new and compiling existing geologic and hydrologic data from wells, new geologic field mapping, correlating geologic maps with existing geophysical surveys, and developing hydrofacies maps. Research Element 2—Assessment of the streambed properties of Lehman, Baker, and Snake Creeks and quantification of the volume of water exchanged between the ground- and surface-water systems. The potential and rate of exchange of water between the flow systems are a function of the degree of hydraulic connection and difference between river stage and aquifer heads. Lehman, Baker, and Snake Creeks exhibit highly variable gain and loss conditions. Because these conditions occur largely in, or in close proximity to Great Basin National Park, a better understanding of the spatial and temporal ground-water/surface-water relations along these creeks are of interest. Element 2 will be accomplished by heat tracing, aquifer testing, and seepage runs. Figure 2. Study area in Snake Valley, Nevada. Research Element 3—Delineation of the sources of water to Rowland and Big Springs. using the chemical mixing model, NETPATH. Research Element 4—Refine estimates of interbasin flow between southern Spring and southern Snake (Hamlin) Valleys through the Limestone Hills. The magnitude and direction of subsurface flow through the Limestone Hills will be quantified by delineation of ground-water divides in the study area and reliable estimates of the hydraulic gradient, effective thickness of the permeable carbonate rocks, and effective hydraulic conductivity of these permeable rocks. Element 4 will be accomplished by applying the Darcy Equation to refined hydraulic property and gradient estimates. The results of these research elements will be summarized in a multi-chapter USGS Scientific Investigations Report. The results of this study will benefit the National Park Service, Bureau of Land Management, U.S. Fish and Wildlife Service, U.S. Forest Service, Nevada and Utah State agencies, as well as interested stakeholders by providing relevant hydrologic data to better quantify the current hydrologic condition, and proactively assess potential effects on ground and surface-water systems from proposed large-scale ground-water withdrawals. This study is aligned with the USGS science strategy goal of informing the public and decision makers about the status of freshwater resources across America (U.S. Geological Survey, 2007). Elliott, P.E., Beck, D.A., and Prudic, D.E., 2006, Characterization of surface-water resources in the Great Basin National Park and their susceptibility to ground-water withdrawals in adjacent valleys, White Pine County, Nevada: U.S. Geological Survey Scientific Investigations Report 2006-5099, 156 p.
U.S. Geological Survey, 2007, Facing tomorrow’s challenges—U.S. Geological Survey science in the decade 2007–2017: U.S. Geological Survey Circular 1309, 67 p.
Welch, A.H., Bright, D.J., and Knochenmus, L.A., eds., 2007, Water resources of the Basin and Range carbonate-rock aquifer system, White Pine County, Nevada, and adjacent areas in Nevada and Utah: U.S. Geological Survey Scientific Investigations Report 2007-5261, 96 p.
For more information about USGS activities in Nevada, visit the USGS Nevada Science Center home page.